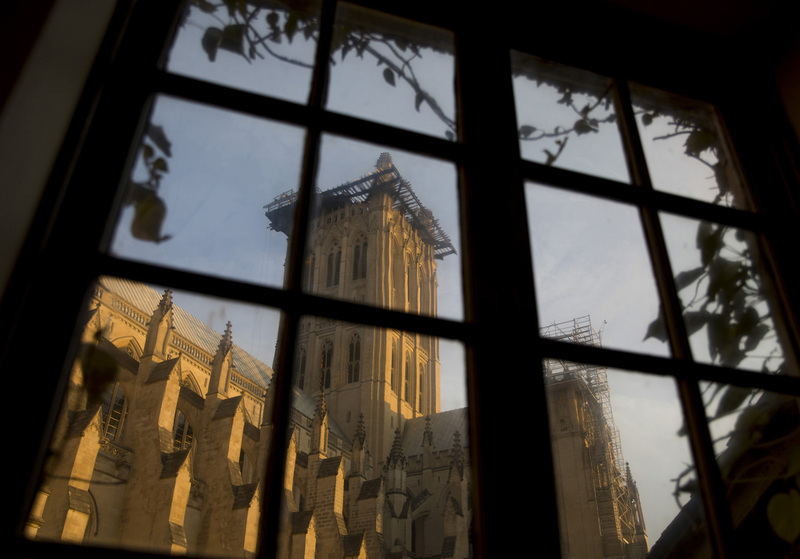 Chip By Chip, Restoring The Damaged Washington National Cathedral The famous cathedral was damaged seven years ago in an earthquake. Master stone masons are still working to repair the intricate Gothic stonework on its iconic towers. 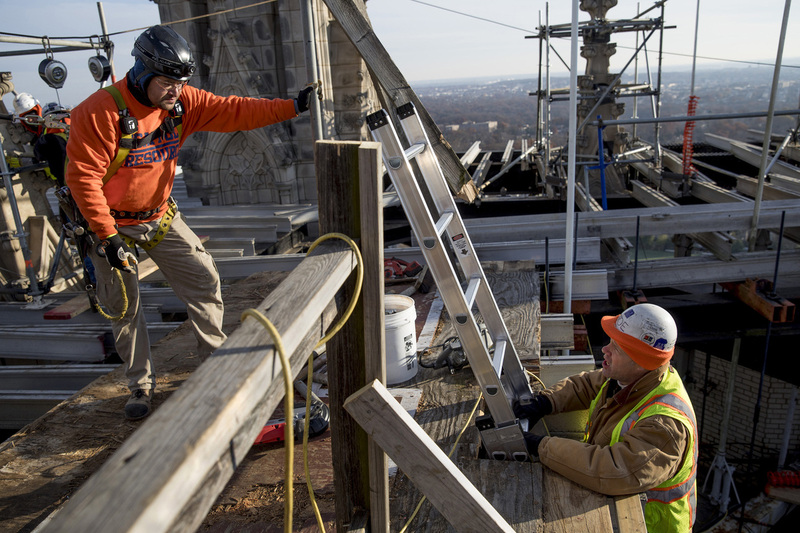 After the Washington National Cathedral was damaged in an earthquake seven years ago, master stone masons are still working to repair the intricate Gothic stonework on its iconic towers. 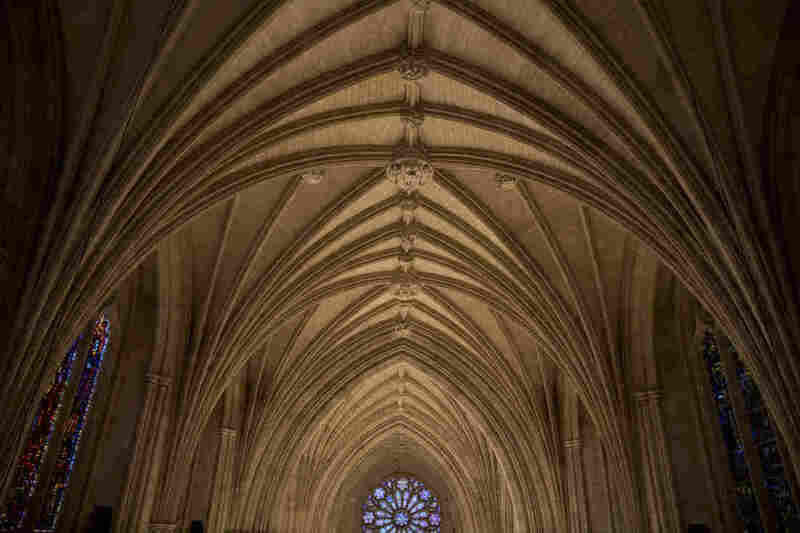 Washington National Cathedral, a towering Gothic cathedral in the nation's capital, was in the national spotlight earlier this month when it hosted President George H.W. 's Bush's state funeral. Its staff is currently preparing for its annual Christmas services, and visitors regularly flock there to see the final resting place of President Woodrow Wilson, Helen Keller, and other notables. It's also one of the most distinctive elements of the city's skyline, with its Gothic towers, its elaborate stained glass windows and — for the past seven years — its scaffolding. If you peer 300 feet up at that scaffolding, you might see little black specks moving about. They are stonemasons and construction workers repairing damage caused by a rare earthquake that hit the city in 2011. Does climbing up on that scaffolding on a biting winter morning sound inviting? Not particularly. But if head stonemason Joe Alonso offers to give you a tour, you take him up on it. "Welcome to the top of the world," Alonso told me as I hoisted myself up a ladder and onto the highest point in Washington. It was a little past 7 a.m., and his crews were already hard at work. Joe Alonso, head stonemason (right), talks with one of his construction crew members as they work on the scaffolding on top of one of the towers. Alonso pointed at local landmarks — the Washington Monument, Tyson's Corner — as I feigned comfort with the heights and wind. Then, he turned his attention to the tower itself. "These pinnacles that you see have rotated and moved and snapped," he explained. "If that quake would've lasted another two or three seconds, we would've lost a tremendous amount more stone." The repair work is a massive undertaking. The earthquake severely damaged three of the tower's four pinnacles — stone spires that rise from the tower's corners. It also cracked dozens of flying buttresses around the Cathedral, jarred columns out of place and knocked a 350-pound hunk of carved stone off the northwest tower and onto the ground outside the main visitor's entrance. Miraculously, no one was hurt. All that damage will add up to about $34 million in repairs. The Cathedral is still working to fundraise the cash; it's raised about $14 million so far and is completing the repair work in phases. "This is probably going to be the biggest stone restoration job in this country, without a doubt," Alonso said as he looked around. "Maybe the world. I don't know. Maybe fixing the Sphinx would be a bigger one." 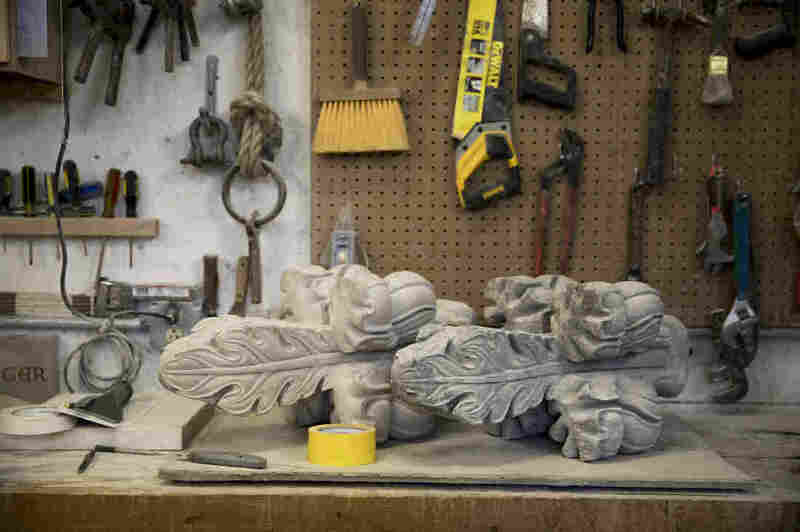 In the stonemasons shop, one of the finials that fell during the earthquake is on the right, and the replacement is on the left. Construction on the Cathedral began in 1907 and continued throughout most of the 20th century. Master carvers — many from Italy — carved its 112 gargoyles, 288 angels and other Gothic elements by hand. It is the sixth-largest Cathedral in the world. Now, the task of repairing and recreating that work is in the hands of two men: stone carvers Sean Callahan and Andy Uhl, both of Silver Spring, Md. The duo spends most of their days not on the scaffolding, but in a dust-filled masonry shop around the corner from the Cathedral's entrance. Many of their steel tools were handed down to them by their predecessors. "We have a whole cabinet full of everything from modern to archaic tools in here," said Uhl as he showed off their workspace. "Sometimes they have the old Italian guys' initials on them." Energy from the earthquake traveled up the Cathedral's towers and cracked enormous blocks of stone like eggshells. Some are fixable, but others need to be recreated in the original carver's style. 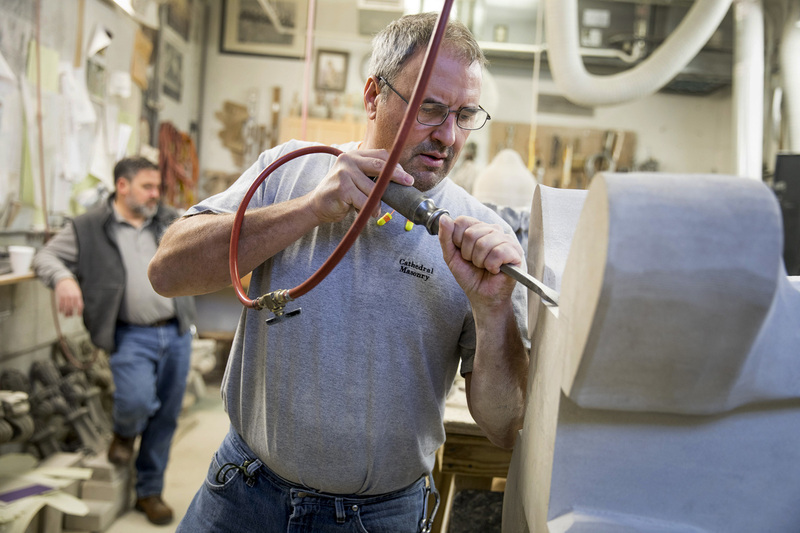 Stonemason Andy Uhl carves the base of a replacement finial that was damaged during the 2011 earthquake with Sean Callahan, fellow National Cathedral stonemason, stands behind him. Callahan showed me a drawing he's working on for a decorative element called a finial. It will eventually go on top of a pinnacle destined for the south side of the Cathedral's Great Choir, which was built in the 1920s. The original finial fell off during the earthquake. Uhl and Callahan's trade is something of a dying art. Their biggest job competitors these days are robots. "They can't do everything a person can do, but robots are getting better every day at reproducing this type of work," Callahan said. Still, those robot scabs aren't skilled enough to carve an angel's eyebrow in the style of a master Italian carver, like Callahan can. For now, there's a lots of work for them here in Washington, thanks to all the federal government buildings, monuments and the earthquake. In an odd way, they're thankful for it. "I get to carve stone," Callahan said. "For us, it let us do more carving." According to Alonso, even if a billionaire donor forked over the rest of the cash they needed tomorrow, the repairs would still take a minimum of five more years. 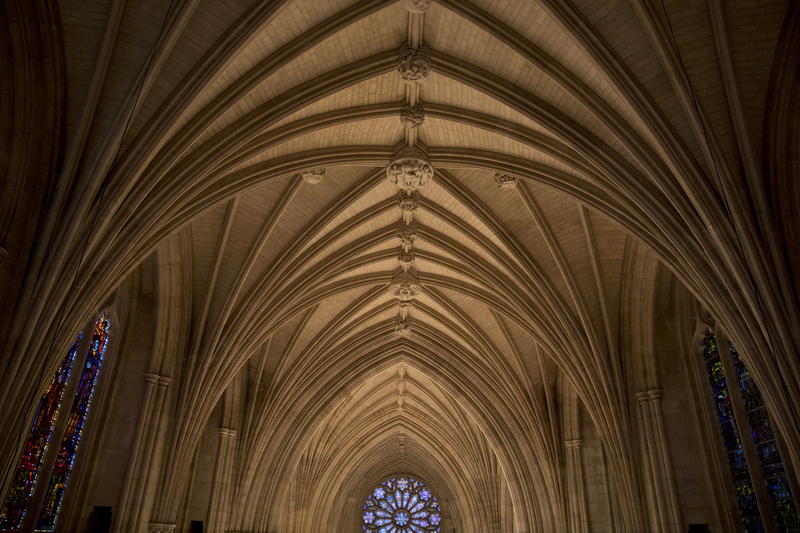 A view of the Washington National Cathedral's main nave. But to him, every chip in the stone is worth it. Back in the warmth of the Cathedral's main nave, Alonso took a minute to think about the work ahead. "It's just incredible. I still, as a stonemason ..." He looked at his shoes as he grasped for the right words. "I'm not the most religious person out there," he continued. "However, this place, it still affects me. It's the craftsmanship and the unbelievable beauty in here. You know what? I guess you could say that's spiritual."